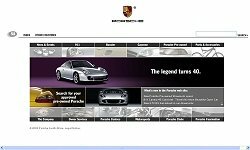 Webdesign plays an important role in the marketing of products. The online identity and presence of your web site reflects directly on you company. The marketing world as we know it today relies heavily upon visual and audio stimulation. The Internet allows you to display your web site with audio, Flash and many other webdesign elements. Whether you require a graphics-intensive webdesign or a minimalistic corporate web design, Intoweb strives to design a web site that meets your companies needs. 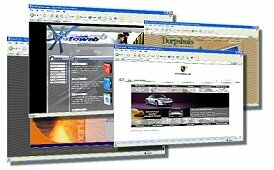 At Intoweb we believe in high quality, professional and unique webdesign for your site. We strive to create designs that stay true to the nature of the company and we have experience in designing graphics for a huge variety of web sites. Our webdesign and webdevelopment team is exceptionally skilled and you can expect professional graphics wih style. 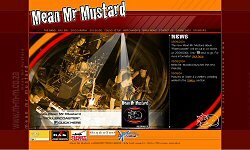 Intoweb is proud to have designed the official Mean Mr. Mustard Website. A professional, yet funky design. Light elements of Flash is used throughout the Mean Mr. Mustard website. 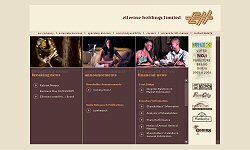 The Ellerine Holdings website required a very corporate design to meet the clients needs. The homepage makes good use of space to incorporate various news items. Founded in 1996 by a group of leading black professionals, Pamodzi Investment Holdings (Pty) Ltd is a multibillion-rand investment company seeking to become a strategic black equity partner of leading businesses in key South African industries. .
Softline VIP is one of the leading developers, implementers and support providers of payroll and Human Resource management software for small to large organisations in South Africa. VIP’s software is used by more than 16 000 companies throughout southern Africa and more than two million pay packages are calculated using VIP’s software each month. 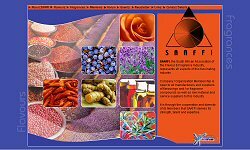 SAAFFI, the South African Association of the Flavour & Fragrance Industry, represents all flavour & fragrance aspects of this fascinating industry. 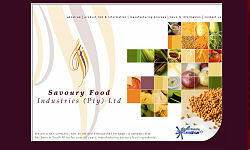 Savoury Food Industries (Pty) Ltd.
A unique wine makers website, highligting one of the leading and exclusive wine makers in South Africa, located on the Northern side of the Simonsberg Mountains. These wine makers have a quality wine not easily found elsewhere. 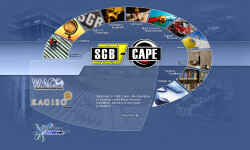 The SGB Scaffolding Systems site makes use of a splash page which allows the user to choose between a flash enhanced as well as a standard site, The menu is a unique circular design. 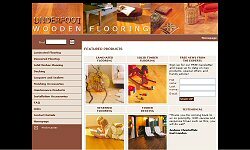 Underfoot Wooden Flooring supply exquisite laminated flooring, veneered flooring, solid timber flooring, decking, lacquers, sealers, finishing accessories and maintenance products. 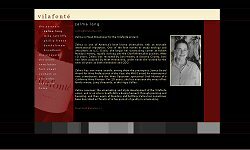 Please continue to the next page if you would like to see more stunning webdesigns from Intoweb.